A cute burger and ice cream shop recently opened up in Arlington, a few blocks west of the Center. Its black and white checkered floor combined with the red vinyl chairs fit perfectly with the retro theme. Brian and I stopped in for a quick bite before bridge. The small restaurant was crowded with families and small screaming children. The staff were clearly inexperienced and overwhelmed. You order at the counter and the food is brought to you. The young boy who took our order forgot to add the onions rings to the tally and had to find us to procure another $5; he also didn’t ask how I wanted my burger cooked and it came out a horrid well done. Brian remembered to tell him medium rare, and his came out a slightly-less-horrid medium. 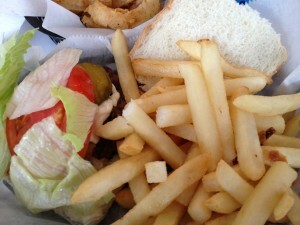 The burgers were slow to come out forcing us to scarf them down so that we could make it to bridge in time. I guess this is what happens when you go during the first month of business. I had a ¼ pound burger with sautéed onions and mushrooms and cheese ($5). I initially thought they forgot the mushrooms, but they were there - just sparse and microscopic. They did forget my cheese. 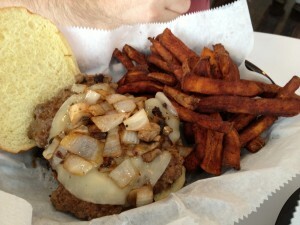 Brian got the ½ pound Rifleman ($8), which was topped with sautéed onions, mushrooms and provolone. We both opted to upgrade our chips to fries for $1.50, regular for me, sweet potato for him. 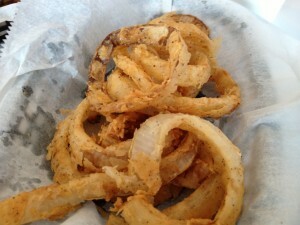 We also got the aforementioned basket of onion rings. All of the fried food was soggy; they need to check their oil temperature. Retro burger serves Richardson’s Ice Cream as well as soft serve and yogurt. I'm hoping that once they settle in they will improve their service and food flaws. It would be nice to have a place for a quick burger and frappe in the area.